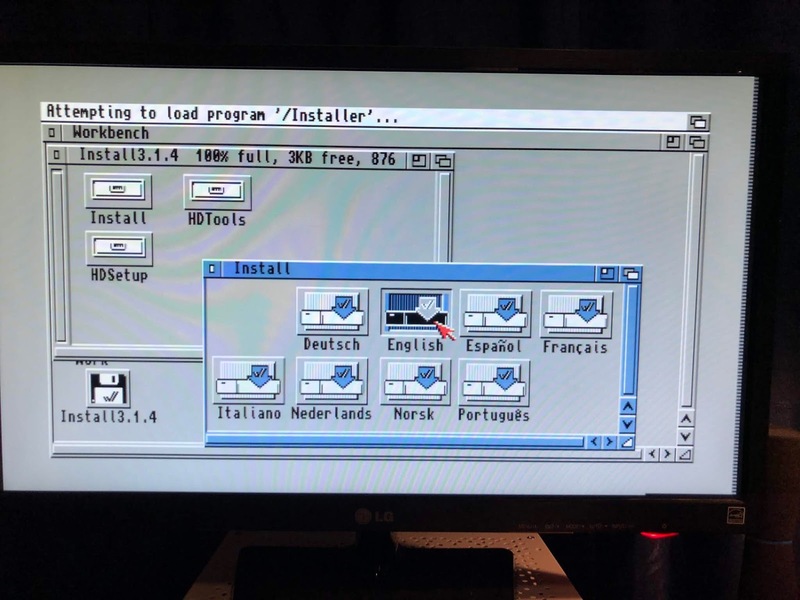 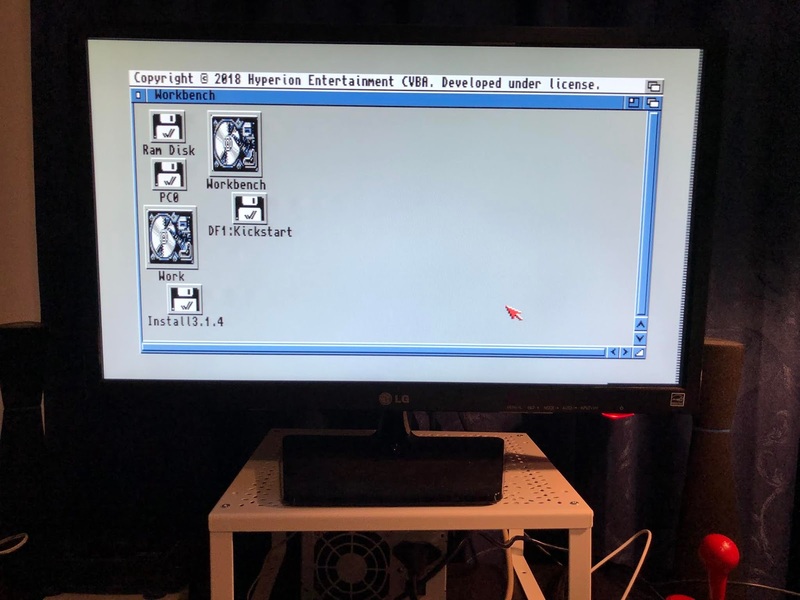 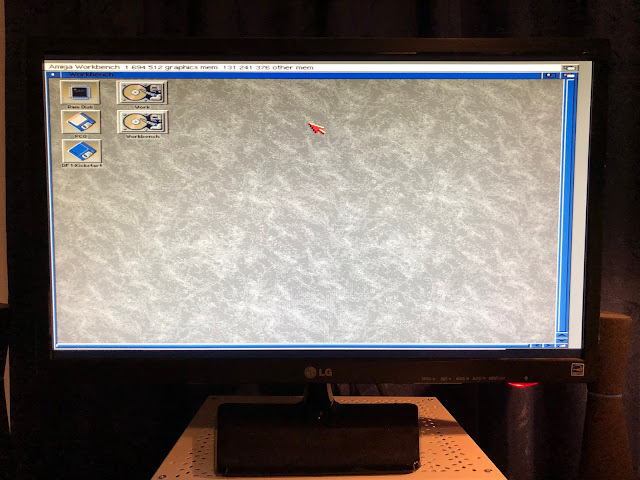 Today for my last blog post for 2018 I am taking a quick look at the installation of the recently released AmigaOS 3.1.4 by Hyperion Entertainment on my Amiga 500. 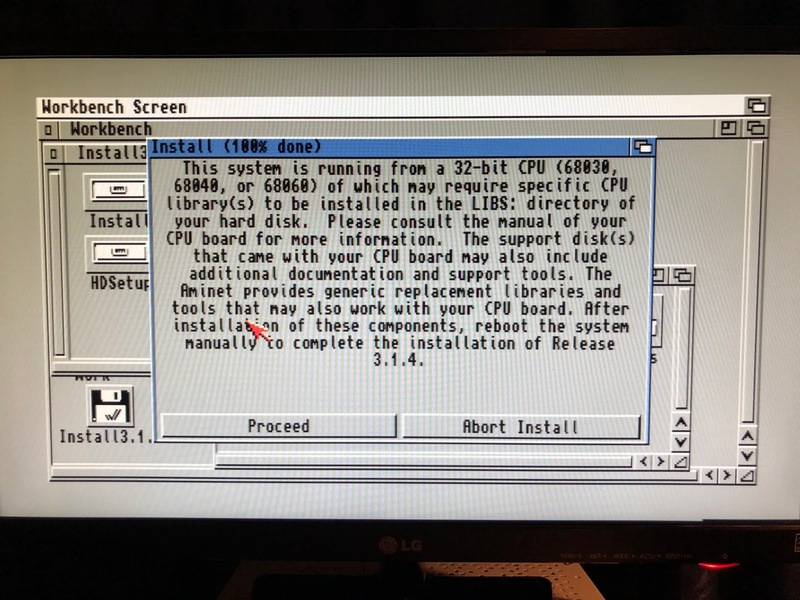 The amazing thing here is that this is the first upgrade for Classic AmigaOS since v3.9 Boing Ball 2 back in 2001! 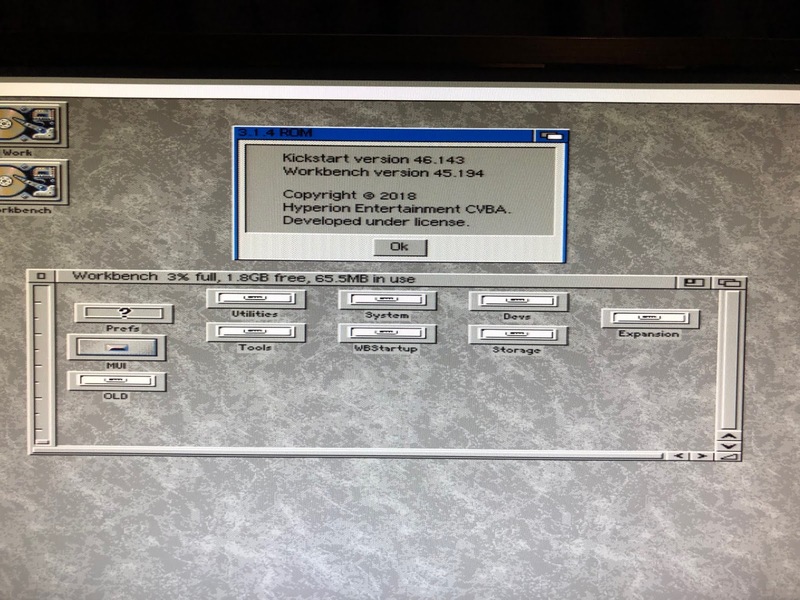 The new Hyperion Entertainment v3.1.4 2018 release is in fact an upgrade to the Commodore released Workbench 3.1 released back in 1993, rather than the AmigaOS v3.5 and v3.9 versions released in 1999 and 2000 by another company called Haage & Partner. 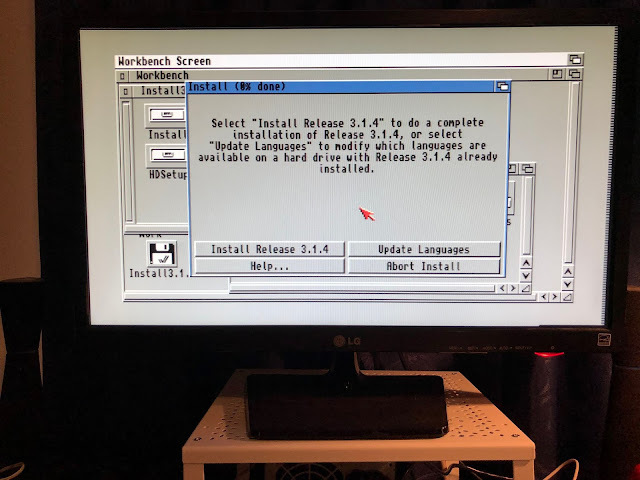 I bought my v3.1.4 release from Alinea Computer. This 3.1.4 release also includes an updated 3.1.4 ROM, which needs to be physically installed in the Amiga 500. 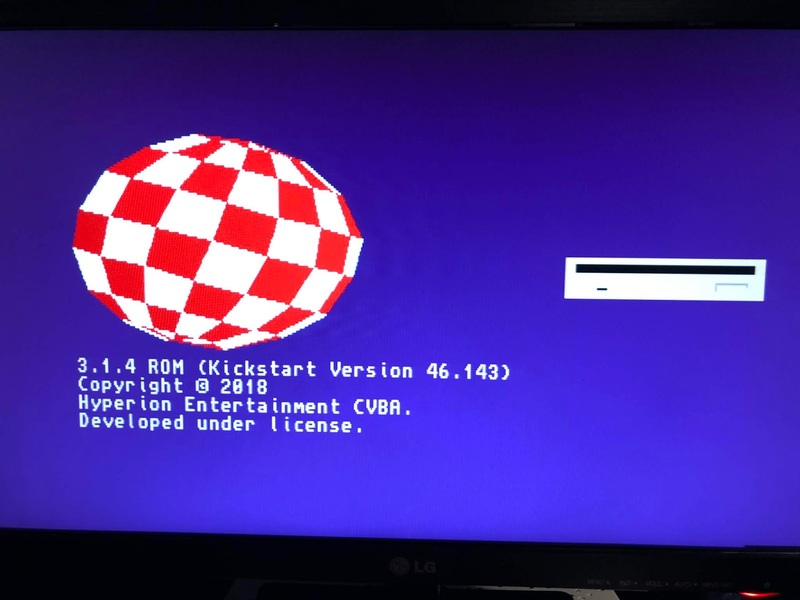 You can register your ROM registration number on Hyperion Entertainment's website to get access to the rom file (for soft kicking on your Amigas if you don't want to use a physical ROM) and some new icons created for the 3.1.4 release. Anyway, I set to work unscrewing my Amiga 500 again for another hardware upgrade! 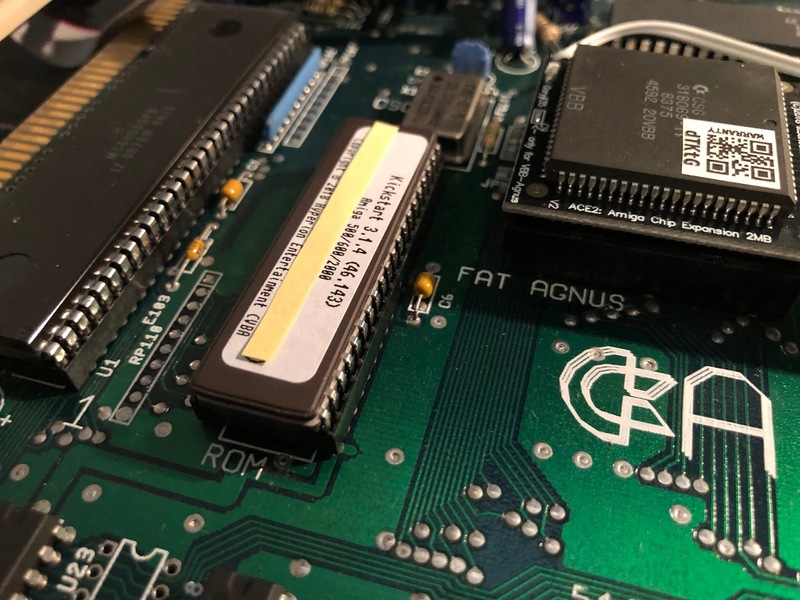 It feels pretty good to have a kickstart rom upgrade for the first time since 1993! 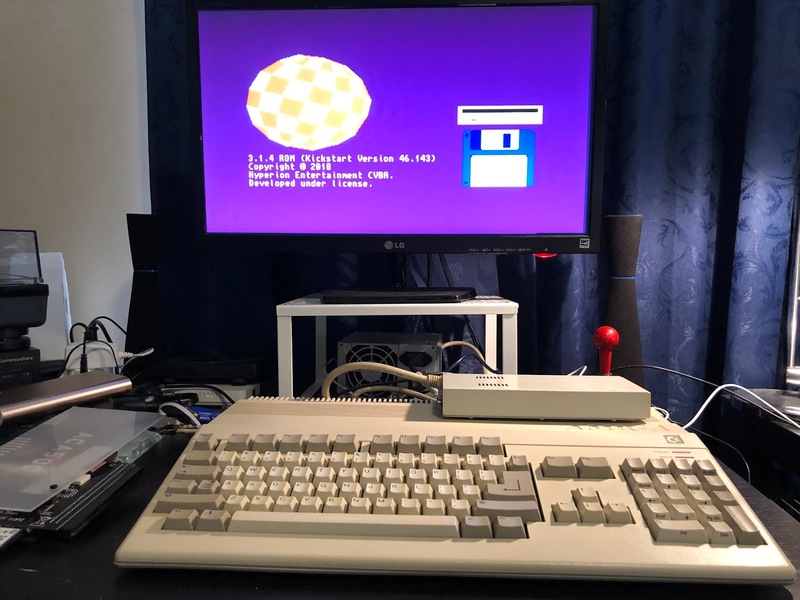 Next I powered on the A500 without any attached devices except the floppy drive. Success! 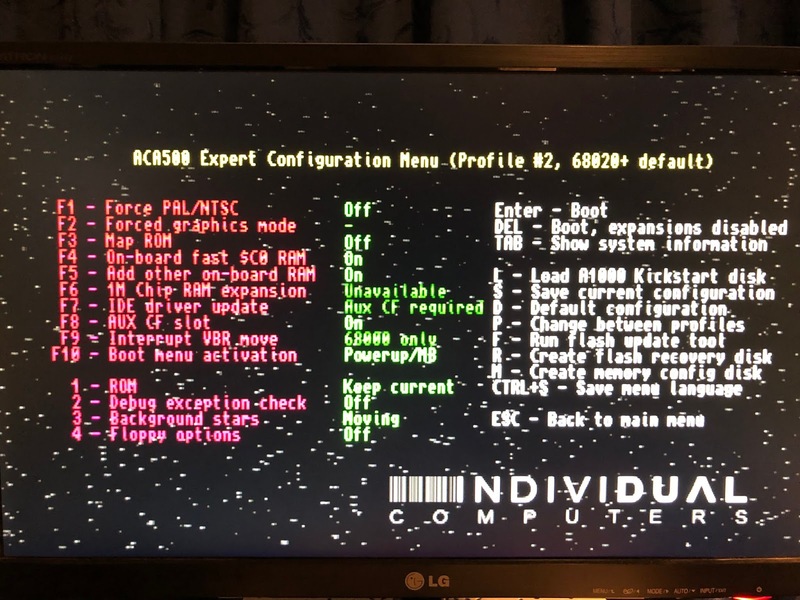 Close up of the new Kickstart insert disk screen, showing the new 3.1.4 kickstart version 46.143, and a boing ball in place of the old checkmark, similar to the kickstarts on NG AmigaOS4.1 FE. 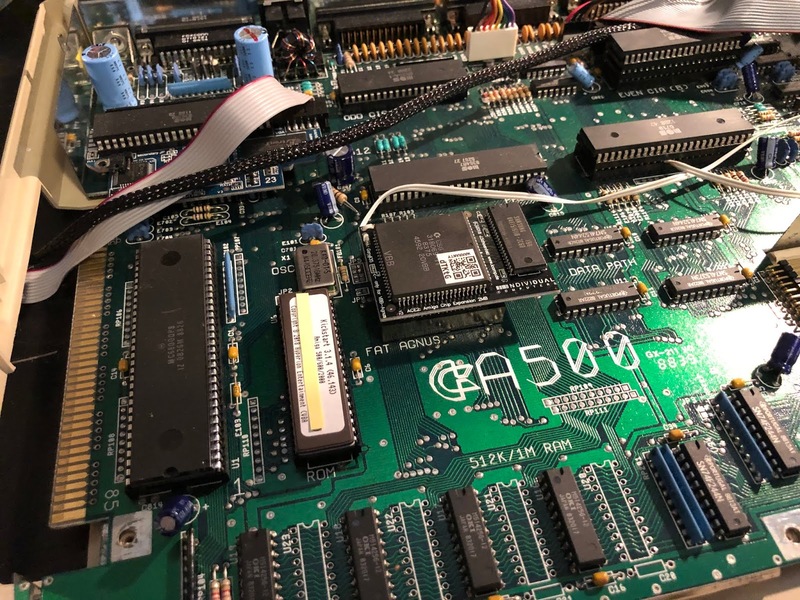 I then attached my ACA500 back onto the A500. 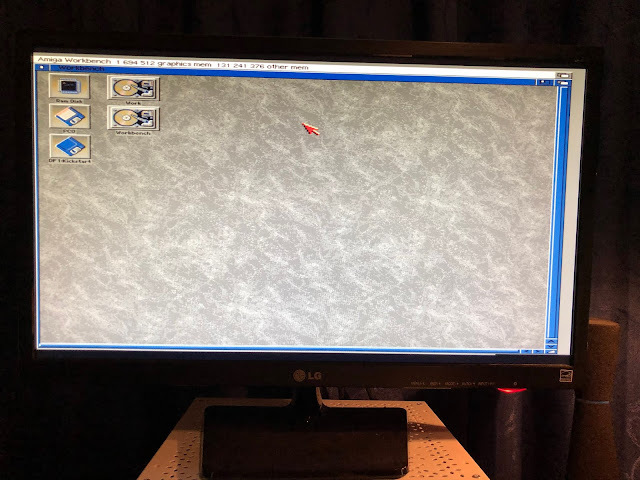 Here is where I needed to do some configuration work before I could go much further. 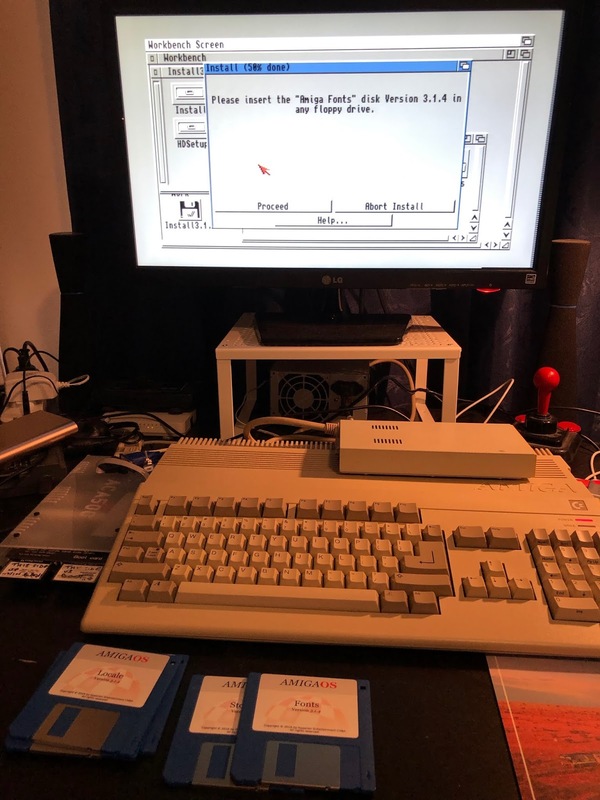 The ACA500 CF card boots Workbench 3.1, which will not work properly with the new rom until I install the new Workbench 3.1.4 onto the CF card. 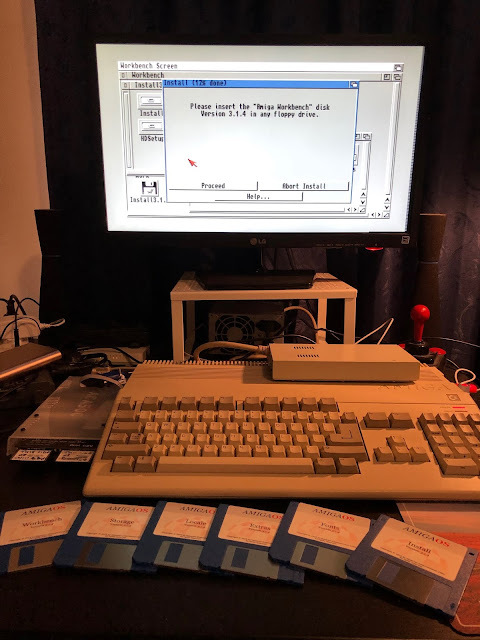 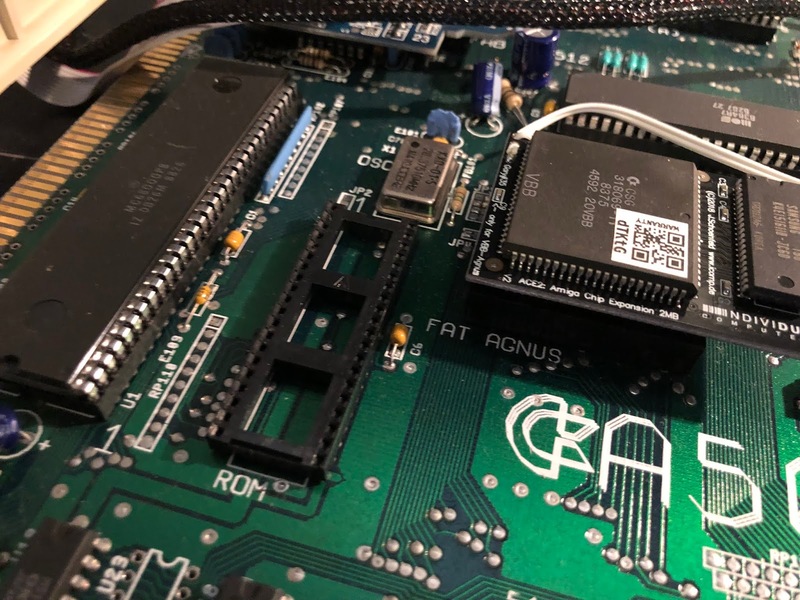 The Workbench and Work partitions are on the Amiga CF card in the ACA500, and the PC0 is the PC FAT32 formatted CF card in the other slot on the ACA500. 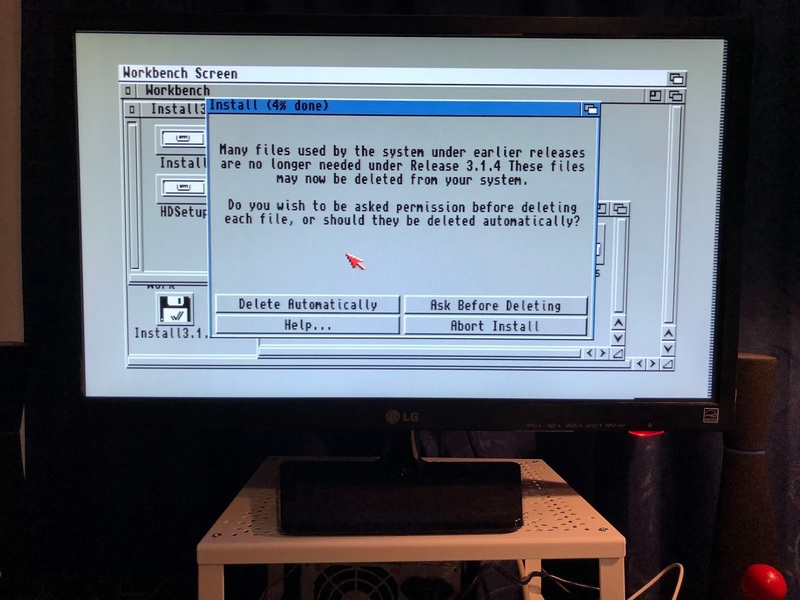 The gotek is using a A1000 kickstart disk adf so that it can't boot (in case you were wondering). 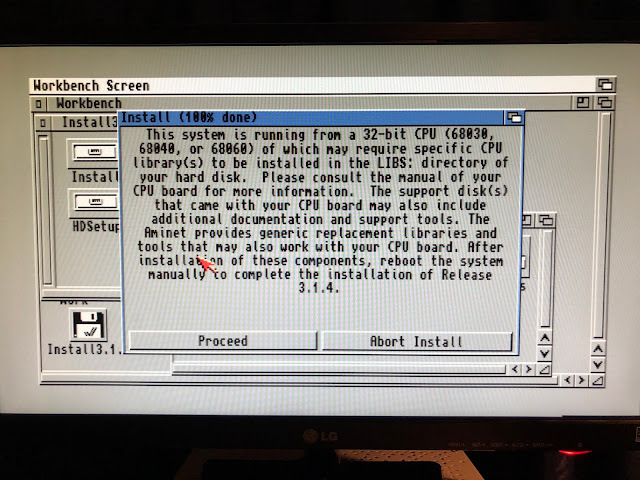 The installation warns me that it has detected an 030/040/060 CPU (from the A1200 accelerator attached to the ACA500) and I should ensure the appropriate libraries are installed for it before rebooting. 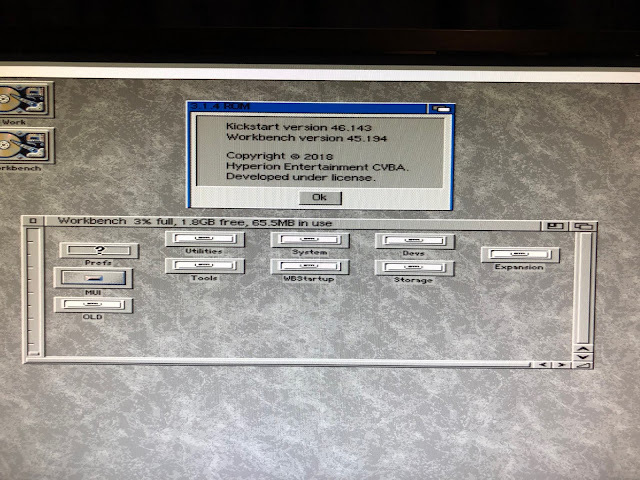 For an 030 accelerator there is no specific libraries I am aware of. 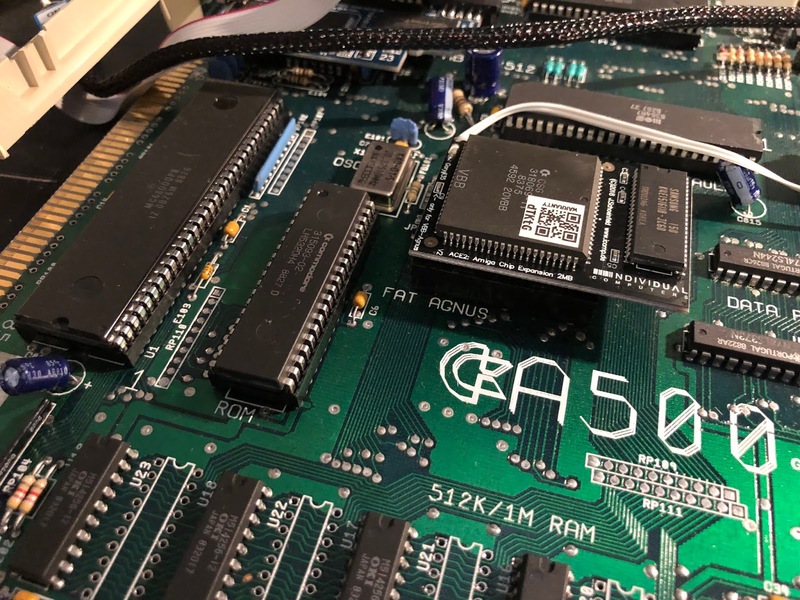 This warning normally applies to 040 and 060 accelerator cards. So I didn't do anything further and proceeded anyway. I then rebooted from the CF card in the ACA500 and very soon my new upgraded Workbench 3.1.4 appears. 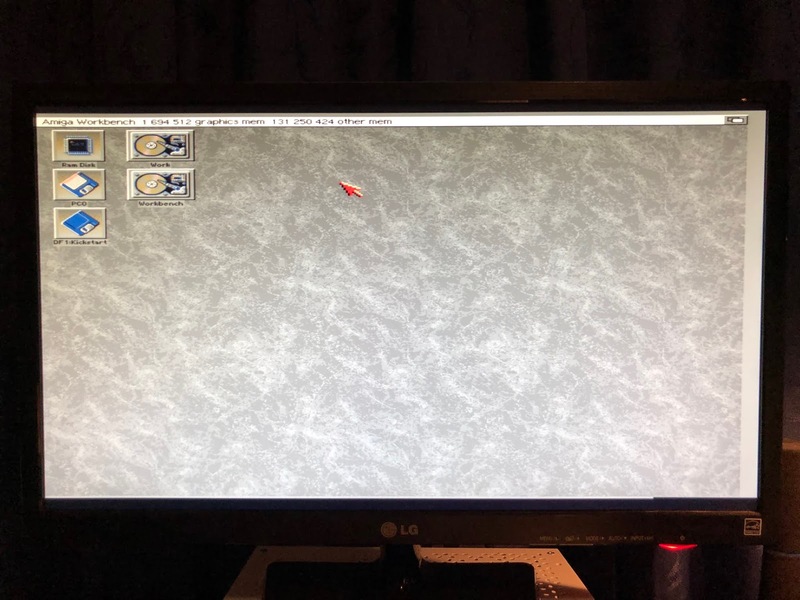 I see it has maintained my MagicWB colours and icon settings, and as expected it has blown away my Dopus 5 workbench replacement installation. 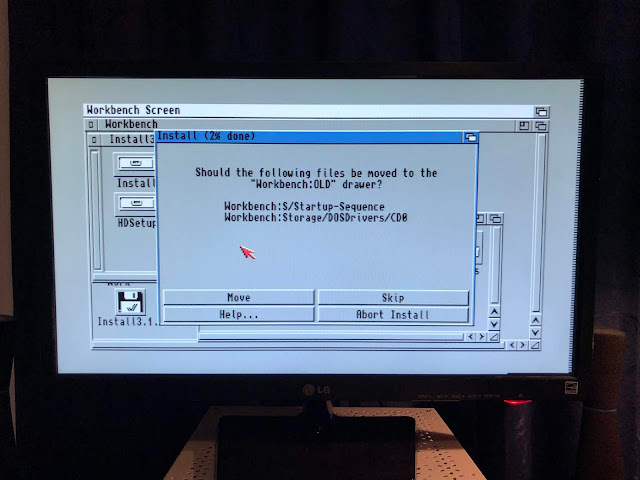 I get rid of the backdrop first of all to uncluttered the workbench, never did understand why that was included in Workbench! 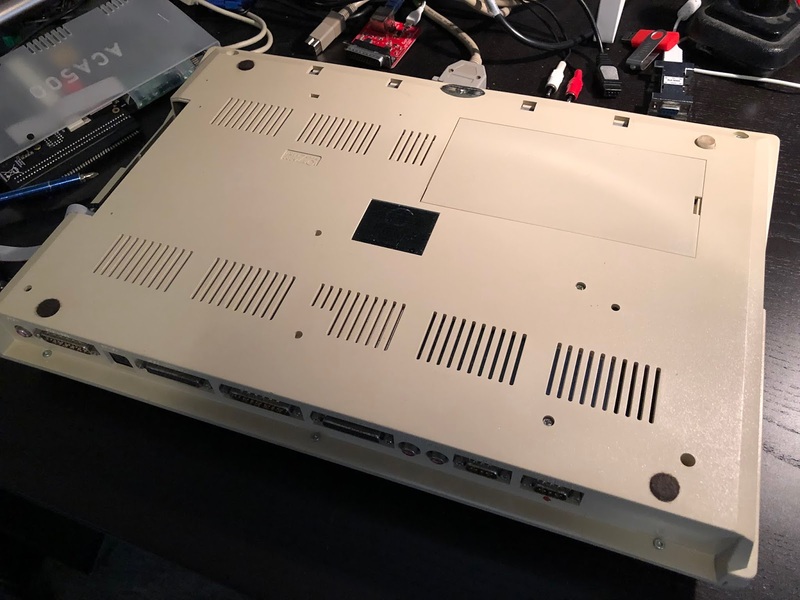 That done I took a look around the drawer structure and everything appears as I would expect. 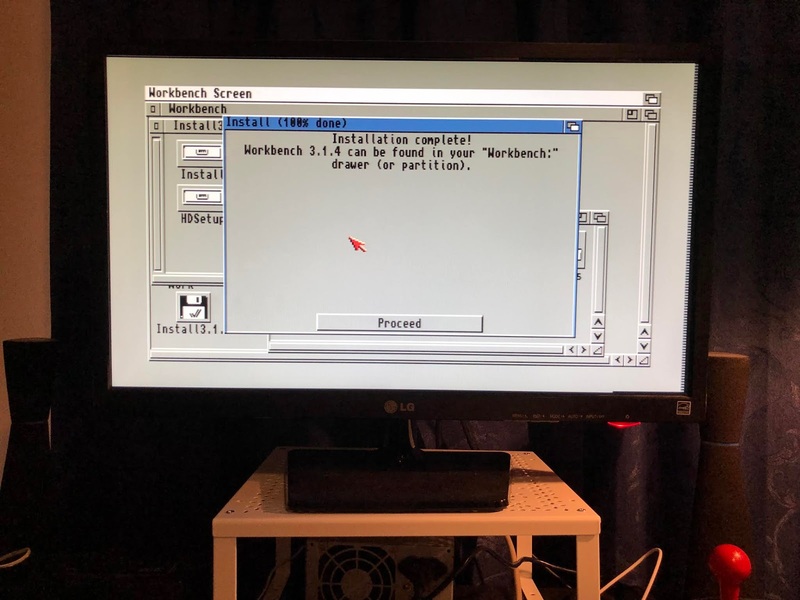 Workbench 3.1.4 changes are mostly under the hood. 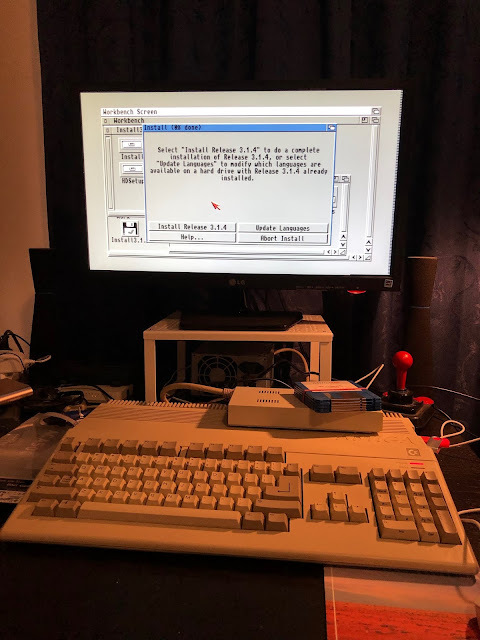 I plan to do a deep dive on the new features and updates in v3.1.4 in 2019 but for now I am glad that it is up and running on my Amiga 500. 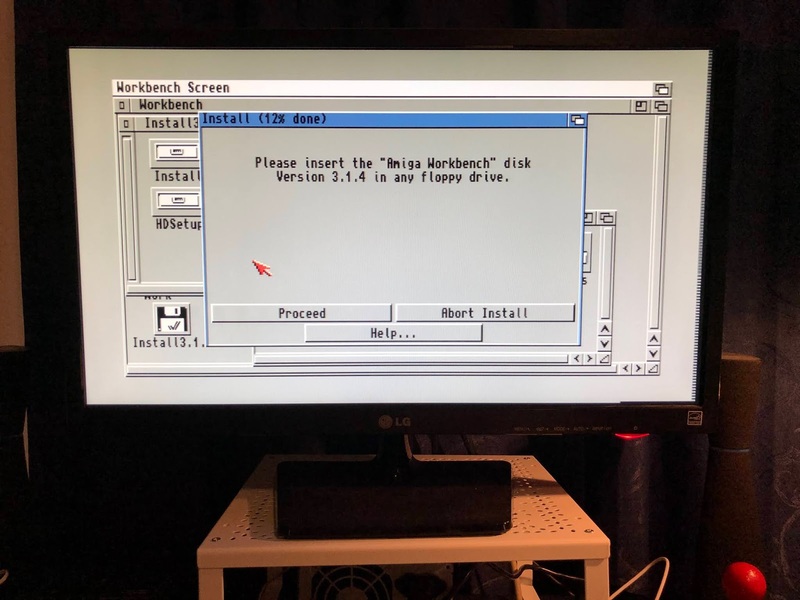 I plan to add Workbench 3.1.4 and kickstart roms to my A600, A1200, A4000D and A2000 too in due course! 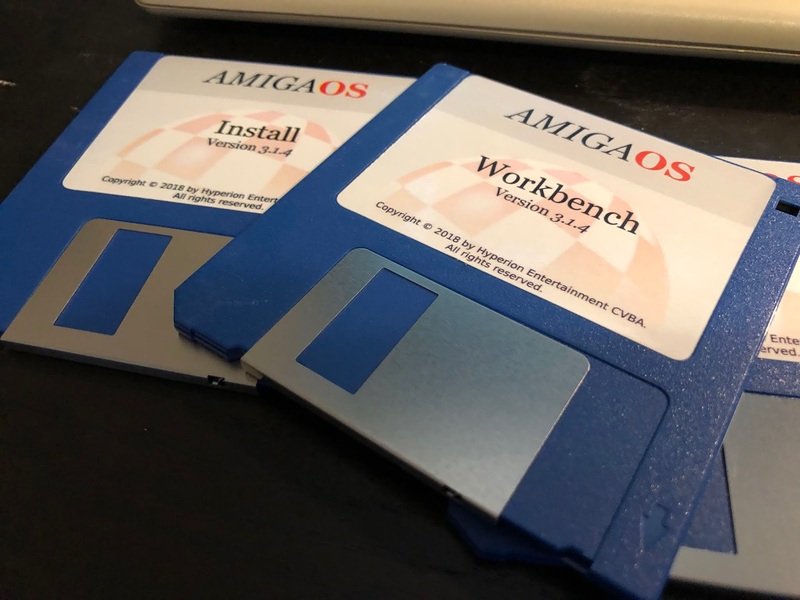 I bought additional copies for each machine. 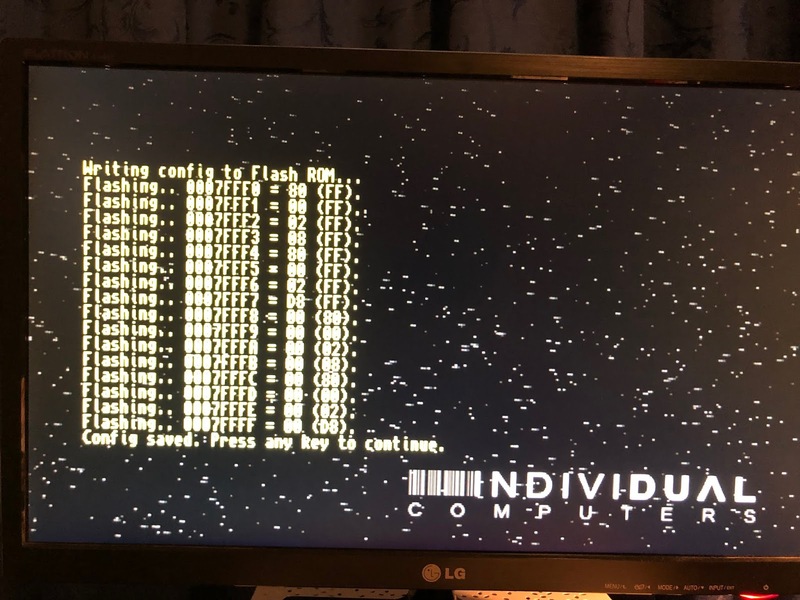 I hope you have enjoyed my blog this year, and I look forward to do more blogging in 2019. 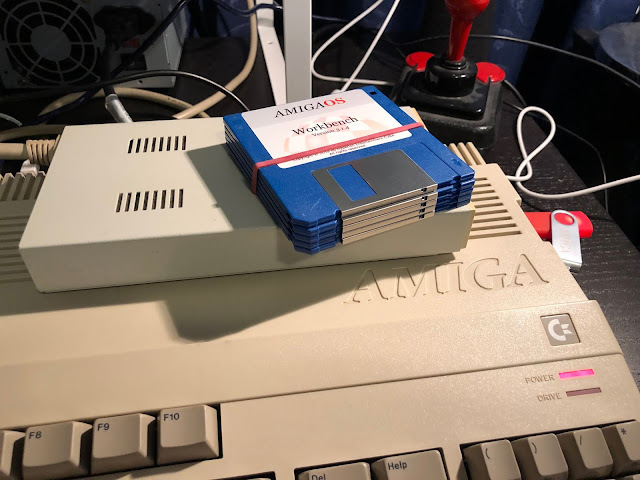 Please note that I will be going on holiday soon and moving house in the new year, so all my Amigas will be packed up and will not be accessible for some time from now. This is why this blog entry is a lot shorter than I originally planned, as I wanted to get it out before I packed up. I expect to resume blogging as soon as I am set up again with my Amigas in my new place. 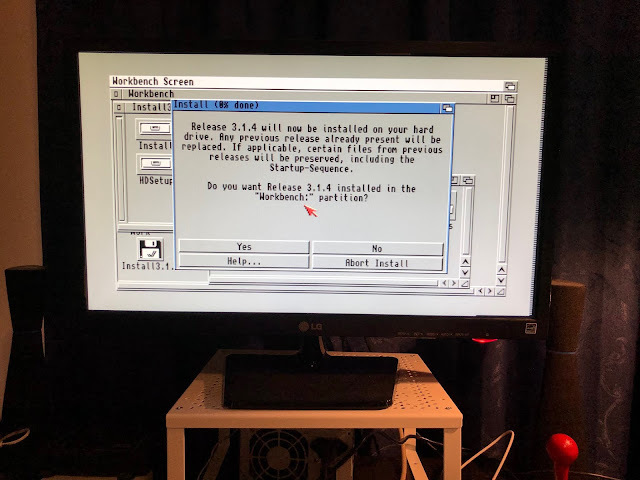 I am not sure exactly when that will be but I will try to get it done asap. 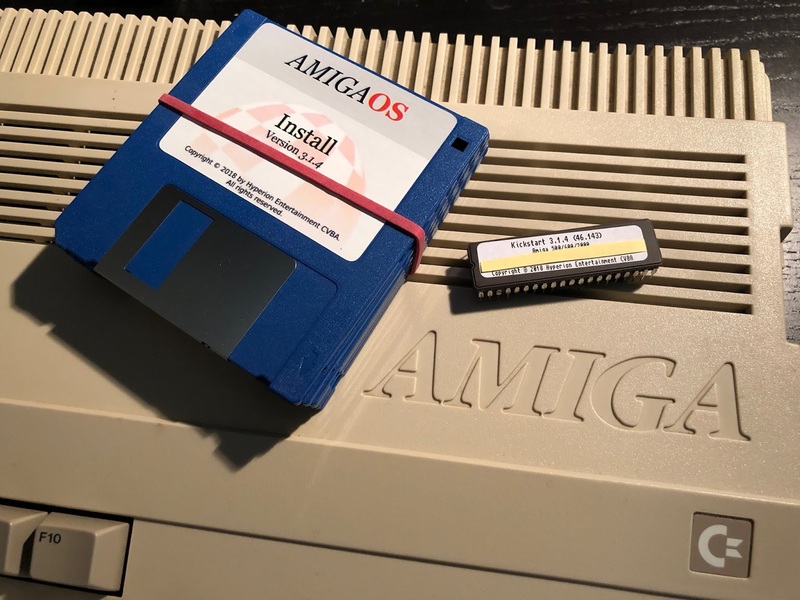 In the meantime, I wish you all a Merry Xmas and Happy New Year, hope you continue enjoying your Amigas (Classic or NG) and see you again in 2019!